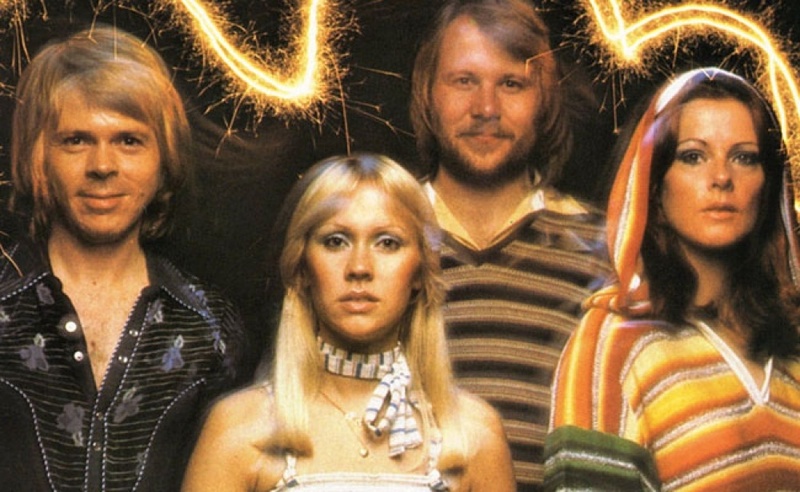 In the immortal words of ABBA, breaking up is never easy. Like any form of rejection, learning that one of your subscribers wants to bow out of your brand’s emails can be a hard pill to swallow. However, it’s important to remember that how you wave goodbye to your subscribers can be just as important as how you welcome them. 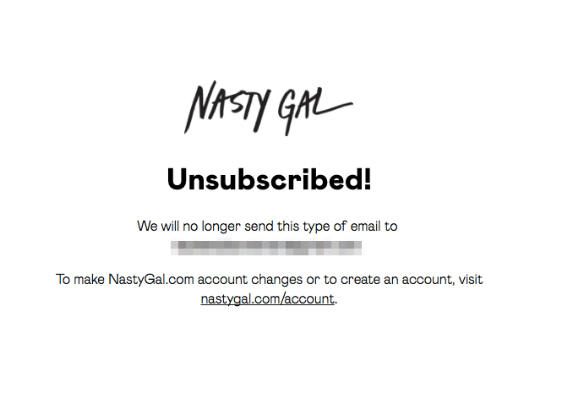 Just because someone has unsubscribed from your brand’s emails doesn’t mean they won’t continue to shop with you (on and offline). A subscriber may still want to hear from you, but you might just be sending them more emails than they want from you. If your unsubscribe process is cold and void of emotion, or - worse still - a trap that actually stops people unsubscribing at all, people will slowly but surely start to resent you. To find out how brands out there are currently dealing with the dreaded unsubscribe process, we opted out of 50 different brands’ emails to see how they coped. From being sad and emotional to stoical and borderline aloof, here's what we learned - along with some key takeaways that you may want to apply to your unsubscribe process. Which category does your brand fall into? 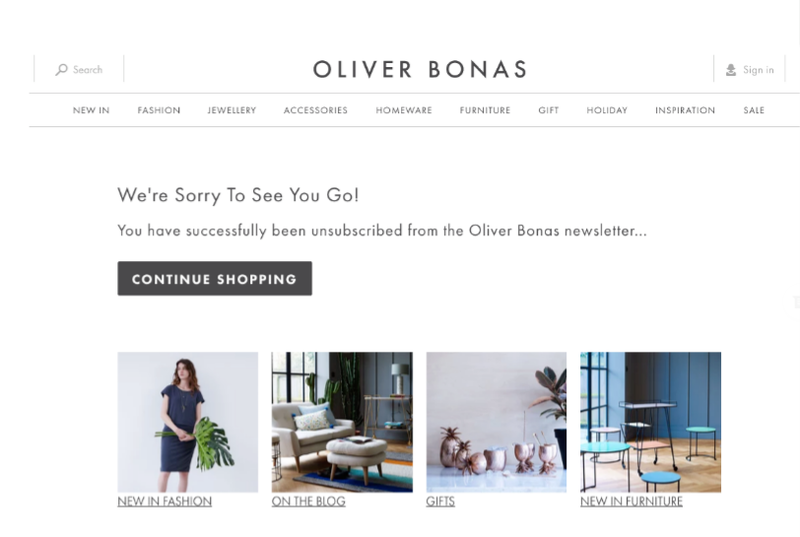 Some brands were impressively upbeat and friendly when we unsubscribed from their emails, Oliver Bonas being the perfect example. 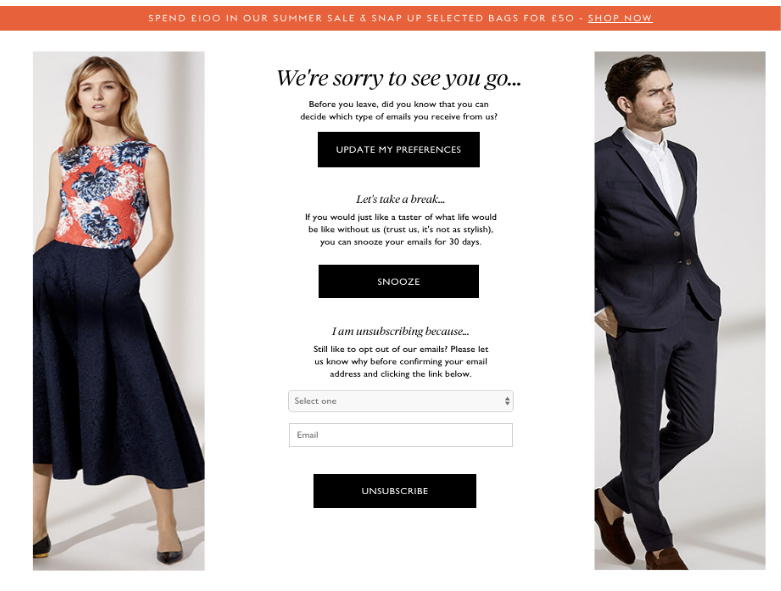 The brand cleverly managed to squeeze in a sneaky call-to-action (CTA), encouraging us to "continue shopping" despite opting out of their email marketing. By including links (accompanied by inviting images) to interesting content on the Oliver Bonas website, the brand takes the opportunity to encourage engagement one last time. Don't take it personally when someone unsubscribes from your emails. How you deal with their decision to opt out will influence how they think about your brand in the future. Don't create any dead ends in your unsubscribe process - ensure that even your unsubscribe page encourages people to carry on browsing. 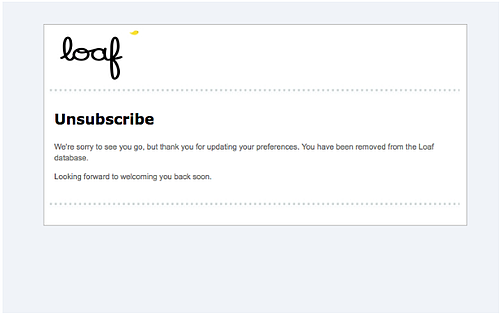 Some brands went out of their way to change our mind once we'd hit the unsubscribe button. This usually involed a landing page offering subscribers different ways they can 'manage their subscription' opposed to unsubscribing completely. Jaeger, BONOBOS and Forever21 are all brands that go all out when it comes to saving their subscriber base, doing whatever they can to offer an alternative to opting out. We were particularly impressed by Jaeger's "snooze" option, tempting existing subscribers to try taking a break before actually cutting ties. 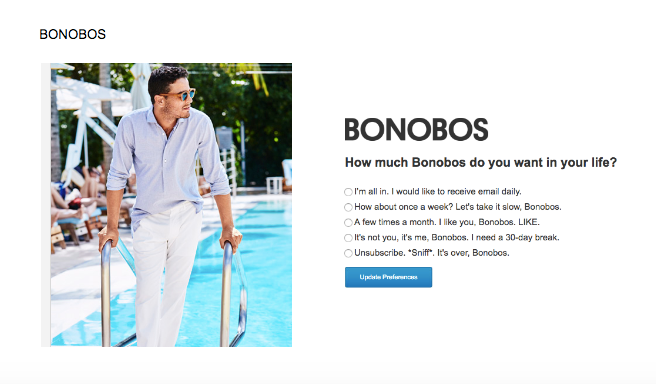 We also liked BONOBOS' more cheeky approach, with the last option - *Sniff* It's over, Bonobos - adding a touch of humour to an otherwise awkward exchange. Key takeaway: You may find that your subscribers don't want to completely opt out of your brand's emails, but just want to monitor the amount and type of emails they receive. Give them the opportunity to join a list that gets contacted less frequently. Whilst criticism can be painful, constructive criticism can be game-changing for your business. Asking for feedback during the unsubscribe process is a simple way to find out where you're going wrong - for example, sending too many emails, not personlising your content enough, not offering enough discounts. On the other hand, feedback might also reassure you that your brand isn't going wrong at all, but there is a legit reason this subscriber no longer wants in. Maybe they are on a strict budget and can't resist the temptation of your newsletters, or have decided they're going to only use email for work correspondence. 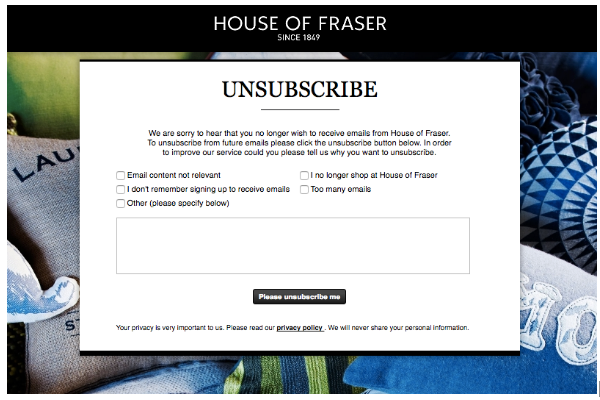 LOFT and House of Fraser both requested feedback when we unsubscribed, making us think about why we no longer wanted to receive emails from them. Key takeaway: Don't bury your head in the sand. If people don't want to hear about your brand anymore, it's crucial that you have an idea why, so build a feedback loop into your unsubscribe process. There's nothing wrong with letting your subscribers know you're going to miss them, or demonstrate that you really value their engagement. However, it's important not to quite literally guilt trip people into staying a subscriber, making them feel like an evil person just because they're longer interested in you. As per, it's all about balance. Show you're disappointed, but also show that you definitely won't take it personally and hope you can reconnect in the future. This balance is perfectly shown in the examples below, from Next - who remind us of all the perks of being a subscriber - and boohoo - who remind us of how much we will miss out on if we go. If your brand is the sensitive and expressive type, the key is to show you're gutted they're leaving you without coming across too clingy. Use your unsubscribe page as an opportunity to remind the unsubscriber about everything they're missing out on if they go ahead and cut ties. 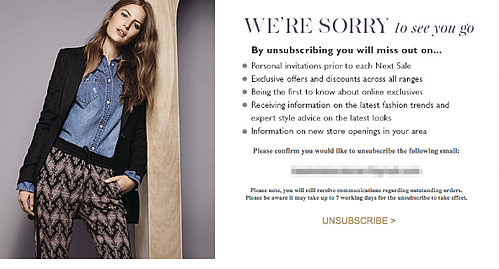 For some brands, their "unsubscribe" button actually means "unsubscribe". Of the 50 brands that we unsubscribed from, 19 removed us from their mailing list automatically when we requested to do so - without trying to change our minds or off us an alternative option. Whilst automatically unsubscribing gets rid of the potential for aggro from subscribers for whom enough is enough, we were surprised that so many brands opted for this strategy without trying to win people back around. Key takeaway: Think hard about your subscriber base and whether an automatic unsubscribe process would suit them best - does it paint your brand in the best light? Does it attempt to engage people who have just unsubscribed? If not, then it may be worth considering some of the options above in this post. Ultimately, there is no right or wrong approach to the unsubscribe process - it all depends on your brand's personality and relationship with recipients. Our advice is to do everything you can to keep a subscriber on board, especially if they're a customer (well, maybe draw the line at turning up at their house with chocolates and roses, but you catch our drift). And if you can't convince them, then gathering feedback is equally good. It's also important to think hard about the tone of voice your brand adopts across its marketing - for example, are your newsletters chatty and conversational or chic and sophisticated? Just because someone is unsubscribing from your brand doesn't mean you should have a personality transplant - going from being completely unbothered to confessing your undying love, or vice versa. We'd saying the main thing is, as Shakespeare said, to thine own self be true.